After all the excitement of the Android M preview and other announcements at Google I/O 2015, one of the biggest game-changers still only exists as a pilot project. But when Google Now on Tap comes full circle, you can bet it's going to completely change the way we think about Search, Google Now and Android itself. 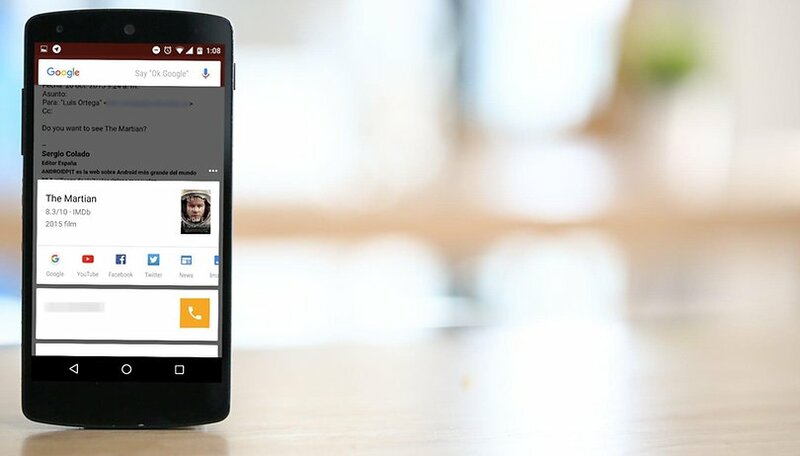 Google Now voice commands: how many do you know? Aparna Chennapragada, Director of Google Now, took the stage during the Google I/O keynote to give some updates on everybody's favorite digital assistant. She mentioned how much more accurate Google Now's voice recognition is now; it dropped from an error rate of 23 percent to just eight percent in the last year. Chenapragada's presentation focused around three key areas for Google Now: context, answers, actions. Google Now understands more than 100 million different contexts. That means that when you ask Google Now something, chances are that it's going to know what you're talking about. Google Now wants to be able to answer questions like, "When is my flight?" "What's their last album?" and "How long does it take to get there?" Once Google Now understands the context of your question, it uses Google's Knowledge Graph, which currently houses more than a billion entities, to provide answers that are meaningful to you. No matter what your question, Google Now has a good chance of knowing what you want: whether it's a recipe, directions, show tickets, a discography, conversion rates, gas station or discounted shopping. Google Now on Tap is the "action" part of the Google Now update. A pilot project with around 100 popular apps, Now on Tap aims to provide Google Now functionality any time you need it, without you having to stop what you're doing. Because Google Now is context-sensitive, it knows the "who", "what" and "them" of whatever you ask, and Knowledge Graph ensures it will have the answer. Google Now on Tap is the user-facing part of this triptych. Now on Tap means you never have to leave the app you're in to get Google Now content.You can ask, "What is his real name?" while using a music player, and Google Now will know that you're talking about the artist you're listening to. It will tell you the answer instantly, all without you having to leave your music player. In Chrome, tapping on a person's name will bring up a Google Now card from the bottom of the screen with Search results on that person. Now on Tap will even understand what might be useful to you in personal communications, so if someone texts you about making dinner reservations and picking up the laundry, for example, Now on Tap (with a long-press of the Home key) will provide a restaurant review and access to OpenTable, Maps, the dialer and Yelp. Now on Tap will even remember to set a reminder about that pesky laundry. Once Now on Tap hits its stride, which may well take a year or more, it will utterly change the way we use our devices. You will no longer need to switch from one task to another by endlessly switching apps — they will all be accessible at the same time. But even more than that, you won't even need to think about switching because Now on Tap will deliver what you need before you even realized you needed it. And that, my friends, is the future. Now on Tap is continually evolving. In December 2015, Google added the ability to take a screenshot using Google Now on Tap, saving you the hassle of an awkward button combination. The addition was made through an update to the Google app. Once you're up to date, you just open Now on Tap and press the share button. You can then share the screenshot with your app of choice. It's a great way to do things if you wish to share a screenshot directly with a friend, or e-mail it to someone, but the image is not automatically saved, so it actually adds an extra step to the process if you just want to store the screenshot on your device. By pressing and holding on a confirmation email for something you ordered, Now on Tap will provide tracking information for the package. You can do the same for flight numbers: whether a confirmation email or a message from a friend, just pressing and holding on the number will display a card with updated information on the flight's status. What do you think of Google Now on Tap? Share your views in the comments. Google Now is pretty awesome, wasn't really bothered with it 18 months ago, but now I use it constantly. I've actually turned it off, but given time it's gonna be part of everything Google and my digital life like Now is. And it doesn't work in Serbia. And how I know on Balkan. Why?? It's almos unbelively, that Google Now on Tap has awareness, buth it really has it... It's a great help for users.